Jung Min Choi was born in Seoul, Korea and started to play the violin since the age of four. She has won first prizes at the Ewha Kyung-Hyang Competition, Music Chunchoo Competition, and Hanmi Competition. She was named a finalist in the 2010 Philadelphia Orchestra Albert M. Greenfield Student Competition and the 2013 Stulberg International String Competition. She has performed at numerous venues sponsored by The Kumho Foundation, J&A Beare, The Stradivarious Society, Merkin Concert Hall, Cultural Events Committee at Pelican Cove, and the 2014 Curtis on Tour. She has appeared as a soloist with Seoul Philharmonic Orchestra, Suwon Symphony Orchestra, and Korea Symphony Orchestra. She won a special prize for the Best Performance of Commissioned Work at 2015 Michael Hill International Violin Competition. She is a graduate of the Curtis Institute of Music, where she studied with Joseph Silverstein, Yumi Scott, and Pamela Frank. 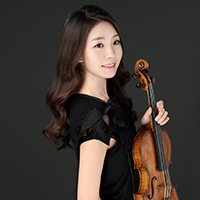 Choi is currently pursuing her Master's degree in New England Conservatory of Music as a student of Miriam Fried.